Tori had her first horse show this weekend! 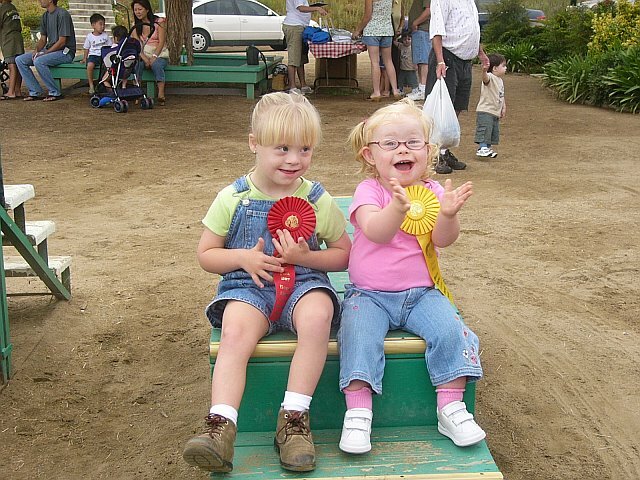 She attends a horse riding program for special needs kids called "Reins" and she loves it! They have an annual competition where the kids have to do simple tasks while horseriding. Tori got third place! Pictured is her friend and our neighbor who lives just 3 houses away and is also part of the program, she got 2nd and they are cheering their success. We really love this program, and are starting to get ideas on what we'd like to do once we do ER! How totally adorable! She and her friend both look ecstatic. 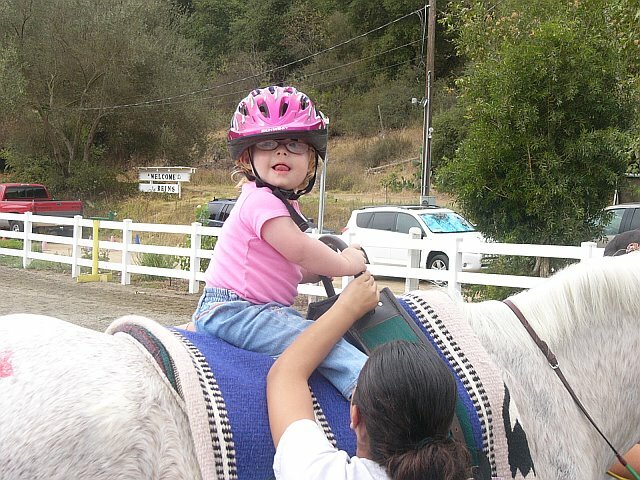 My kids took riding lessons too, and they really loved it. My wife became a stable girl to earn the lessons for them, and for herself too. Those were very good times for all of us! She looks like she is absolutely having a ball! She'll be riding the rodeo circuit before you know it! Laurence , She is just as Ha said adorable and looks to be having the time of her life. Programs such as that are worth their weight in gold. tori looks great up there. horses and kids are a total match. i rode from when i was a little kid. got thrown off a few times and got right back in the saddle. loved it. just yesterday during lunch my sil's cell phone rang with my 13-year-old niece on the line asking them to buy the horse she rides which just came up for sale. brother: "she's not getting her own horse." sil: "then you tell her." Oh boy, I dread that request, aren't horses more expensive than boats to maintain? The progress these kids have made since starting the program is amazing. You don't realize how many muscles get worked riding a horse! Kids much worse off than Tori have reached significant milestones (like sitting up unassisted) in part due to the therapy they recieve here. The icing on top is these horses are all older horses that are now retired from their previous job, and live on a fabulous ranch in Fallbrook (wooded area of north San Diego) walking easy trails, and doted over by a hundred teenage volunteers. Definitely a win-win! Thanks for sharing the joy, Laurence! From "Horses for Dummies", a strongly recommended book for all equine neophytes: "Buying a horse is the cheapest part of the whole experience." Owning a boat may be like standing in a cold shower shredding $20 bills, but owning a horse is like pitchforking wadded-up $20s into a manure pile. Our kid spent nearly three years on dressage. NONE of the adult dressage riders were retired, let alone ERs, and many of them were barely able to afford their lifestyle. There is absolutely nothing about the equine experience that is based on financial considerations-- it's mostly emotional and partly whether it'll help you compete at the next level. but boats don't have those big eyes and soft noses to fall in love with. i think a horse is generally about $250/month for feed & meds plus stable costs. of course, as mentioned, costs can run to anywhere given even a single illness. don't know about pet insurance on horses. my cousin's dog insurance pays 50%. just after wolfpuppy had finished healing from having both back legs reconstructed, while walking him past the local elementary school some little kid asked "i love your dog. how much did he cost?" "kid, you don't wanna know." Laurence, thanks for sharing! They look like they're having a great time. And she's growing up so fast! Definitely keep the pictures coming. Oh, the absolute joy on those children's faces is priceless! She is growing so quickly. Tori and Clara are both so cute. Um, try at least $350 a month for board in most places. I came <this close> to buying one in January for my niece and I to ride. Then I came to my unfortunate senses. Maybe in a few years, when she is 8-9...I can keep a horse at home, but it is a hassle to trailer them back and forth for group lessons (great for kids). I rode competitively from age 7 to 18. It was a very expensive hobby, but I wouldn't trade the life experience, independence and self-confidence it gave me for the world. I owned three horses over the years, and Rocky, a great show horse I owned as a teenager cost $4000 in 1985. We showed the Appaloosa circuit, which was primarily versatility, so we rode Western, English, and some jumping. The dressage/eventing sort of horse showing is much more expensive than breed shows like Appaloosas, Paints, and Quarter Horses. Great pics, and good for her (and your family). Looks like she's having a good time. Great pics Laurence and Brewer.